As a photographer, you are trying to tell a story in a single image. To do this effectively, you need to make it really obvious to the viewer what you would like them to see. An effective way of doing this is to use negative space. By deliberately isolating the subject it draws the viewer into the picture. Using negative space can be quite liberating as it allows you to break some of the other composition rules but retain balance in the image. We’ll look at a few examples to consider how they help to engage with the viewer and tell a story. It is quite easy in landscape photography to create a busy scene. There can often be many competing subjects in the frame. A good way to simplify an image is to reduce the size of the view in the frame so we are left with the subject and a complimenting background that balances the image. 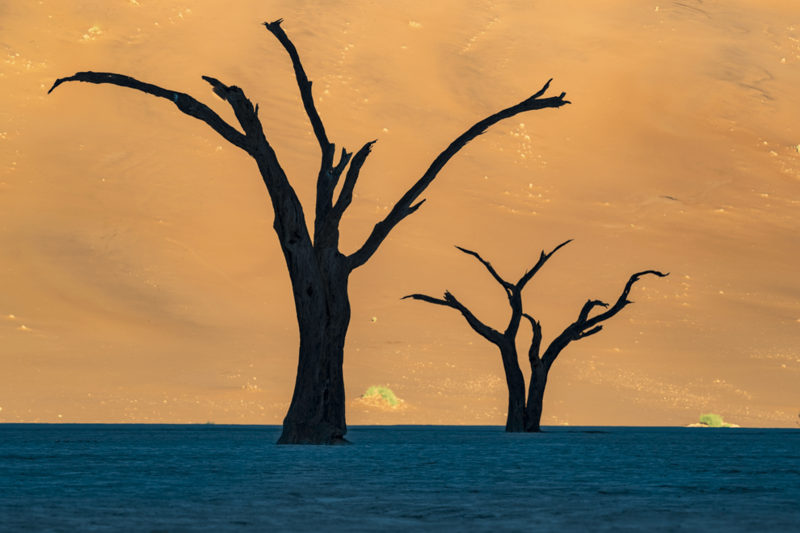 In this first image, we have two camelthorn trees in the Deadvlei, Namibia. By placing them with the dune behind and the blue reflected clay we have concentrated the viewer onto the two trees. 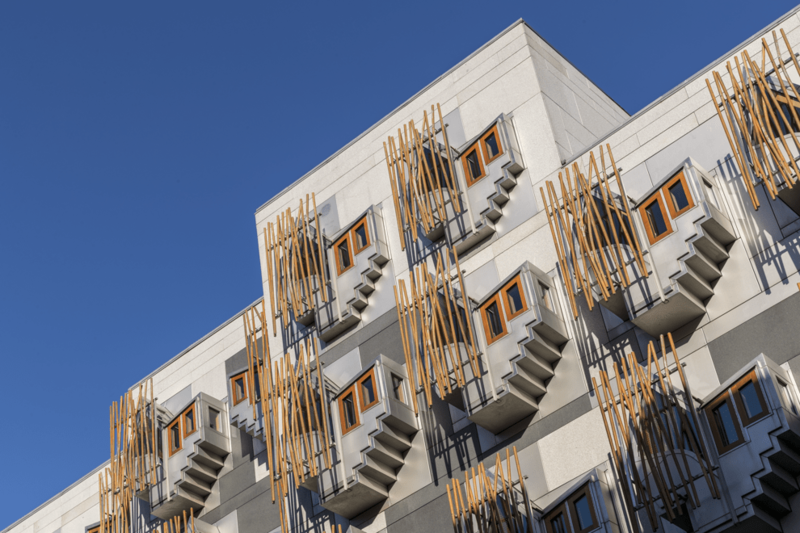 In this next scene of the Scottish Parliament building in Edinburgh, the negative space has been created by splitting the image into two. The geometric shapes of the contemplation pods are clearly the subject. However, balancing the subject with the clear blue sky creates a pleasing image which draws the viewer back to the pods. This image of a Land Cruiser driving through the dunes of the Namib Desert shows that negative space can also be used as the subject. The dunes are vast in size. An image of just the interesting shapes of the dunes would struggle to convey this sense of proportion. 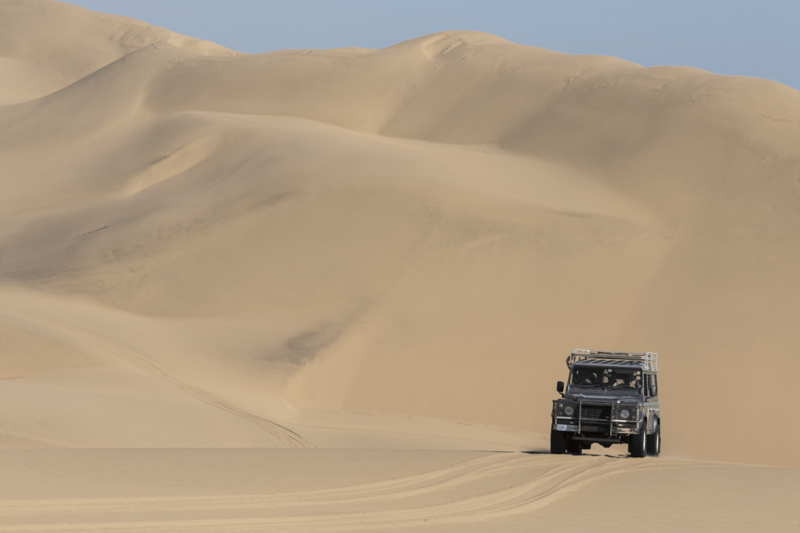 By including the vehicle in the image as a secondary subject the viewer can understand the size of the dunes and then appreciates the space in the end image. Nature photography can really benefit from a good use of negative space. The first image, below, shows a heron with the wind blowing toward it causing the plumage to wave in the air. 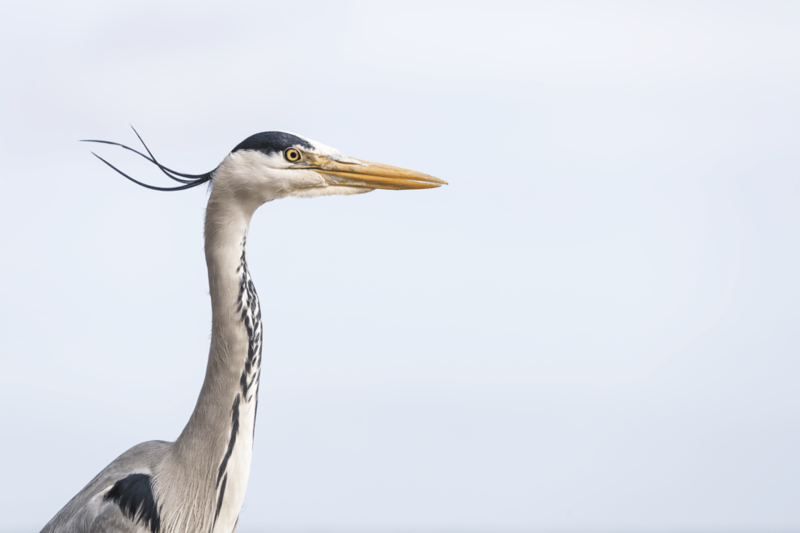 Despite the shot being taken at a busy harbour in St Andrews, I positioned myself, so the birds head was free of background distraction. The image is also helped by the placement of the bird on the left of the frame, so its gaze takes the viewer across the image. The next shot balances the image by having the negative space taking up almost the same area as the subject. 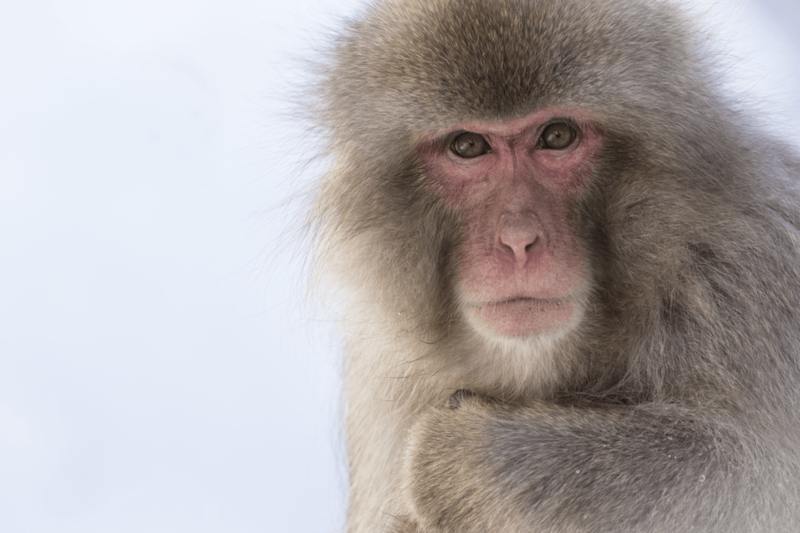 The snow monkeys intense start could be a tight crop and would work well. By adding the space on the left it gives the impression of it being a lone animal in a vast wilderness. In this final image of this section, we can see that the negative space doesn’t need to be blank. 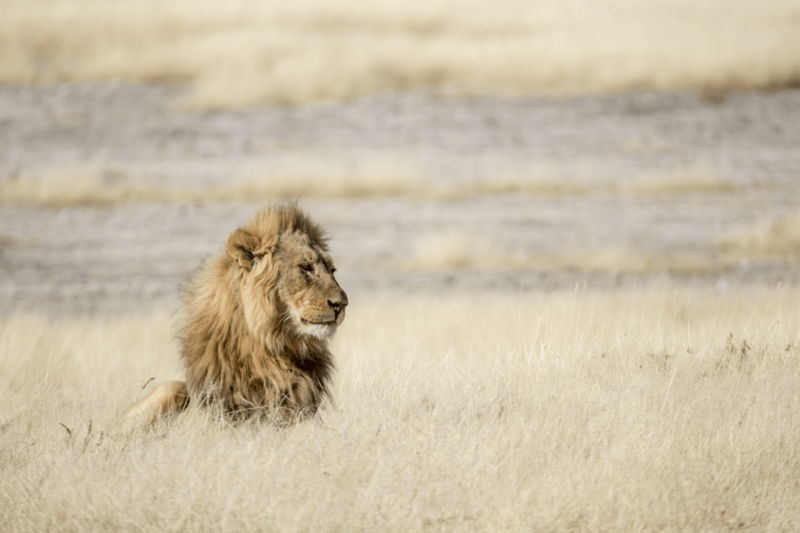 The depth of field has been kept purposely shallow so that the lion stands out from the background. The subject stands out by having darker colours to the rest of the negative space. These final two pictures will show how negative space can be used in either a performance or portraiture setting. This first image of the Nederlands Dans Theatre uses the excellent lighting and costume in the production to create an almost abstract image of the two performers. This final image is of the artist, Alison Watt. 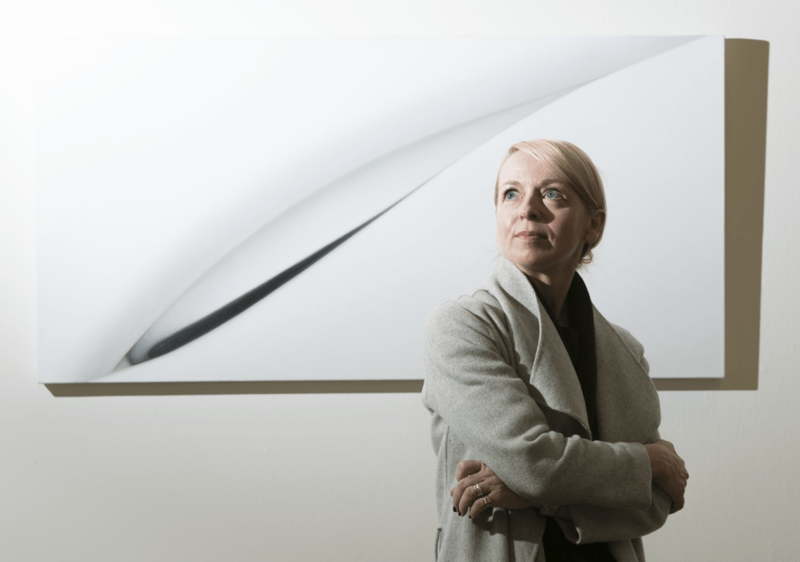 Her work features negative space extensively using paintings of fabric and creating abstract shapes from the folds. By placing the artist in the negative space in one of her artworks and then increasing the area by including the white wall it hopefully nods to her skills. Hopefully, this has given you some ideas on how you can use negative space to give your photographs more impact. I have recently launched a private Facebook group. We will set monthly challenges to help improve your photography. You can apply to join in the challenges by clicking here. You can also sign up to our monthly newsletter where you’ll receive a summary of articles from Edinburgh Photography Workshop. There is also other interesting news and reviews that can help your photography.